The scramble to prepare for the big winter holiday season started weeks ago. There have been moments of joy while visiting with relatives and loved ones, or finding that perfect gift for your kiddo. Then there’s moments of stress when realizing the strings of Christmas lights you’ve spent hours draping over your roof won’t turn on (think Christmas Vacation with the Griswolds). Imagine your six year old getting excited over a single pencil and treasuring it for decades to come. Alice Elizabeth Olsen, another Mesa County Oral History Project interviewee, recalls her husband making his annual sweet Norwegian Christmas bread (Julekage), a recipe passed down by Norwegian ancestors, which she continued to make throughout the remainder of her life. The bread is made with raisins, citron (a large fragrant fruit with a thick rind which became temporarily unavailable during World War II), and cardamom seeds. Photo source: Christopher Tomlinson, The Daily Sentinel. 12-21-1993. Time warping to 1993, Grand Junction celebrated Christmas one special December by bringing in a joyously uncommon holiday creature – a camel. 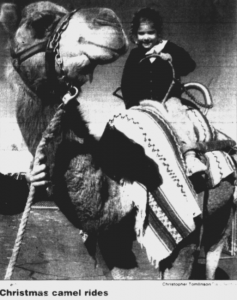 Here is an old Daily Sentinel photo from the Mesa County Libraries’ microfilms of an adorable child enjoying a Christmas camel ride. The camel, Missy, was supplied by the former Bookcliff Exotic Animal Park in Fruita. Posted in General, Local History.